Only a few weeks until the new school year begins. My daughter is ready to begin Grade 1 this year. As her teacher, I’ve been working hard at researching, choosing and gathering everything we need for this upcoming year. I’ve also created a schedule for our year so we know what we need to get done when. I’ve done this for each subject we will be covering. This has been quite a lot of work compiling everything so over the next several posts, I will be sharing all those details. This post I’d like to cover a fun subject: American Sign Language. If you’ve read my previous post on Sign Language, then you know my daughter has been learning Sign Language since she was a baby. Now however, I am ready to start her with a more scheduled learning of this language. I decided to purchase the Classroom Curriculum from Signing Time. The curriculum has more hands on activities that you might see in a classroom setting, as opposed to simply watching a video. It gives them a chance to actively use the signs they are learning, which will obviously help with future retention. There are a lot of activities in each unit, more than you will probably want to use in one year. Beside each activity, it is indicated what grade level(s) it is designed for. Also, some of the games and activities in the curriculum are designed for a group of kids (like there would be in a classroom, or siblings) but the majority are good for an only child as well. So with Grade 1 in mind for a single child, I went through the curriculum and picked out those that I felt would be a good fit. There was still quite a bit I didn’t include, that I will no doubt return to in future years as a review and when learning additional ASL. I’ve put the full schedule on this page. So as you can see, learning Sign Language can just be a small part of each day. If you look at the full schedule, you will see there are a few 1 hour days, and there are some 30 min time slots. However, the majority I would say are 10-15 minutes per day, very doable I believe. To be clear, this curriculum is not something your child will be able to do on their own, but needs full parent participation. On the plus side, you will be learning American Sign Language alongside your child. There are a lot of poems and songs included in the curriculum which is also good reading and singing practice. For Grade 2, my daughter will go through each video of Signing Time Series 1 & Series 2. There are 13 video’s in each series for a total of 26. There are 52 weeks in a year, so doing the math, we could cover one video every 2 weeks, a little faster if we want the summer off, etc. We will pick and choose some of the activities from the Classroom Curriculum to supplement our learning and allow for hands on practice. The first 2 years will be vocabulary based learning. I believe there are around 1000 ASL words taught in the Signing Time series – that will give my daughter quite an extensive vocabulary. However, just like every language, there are different grammar rules and ways of speaking in Sign Language than there are in English, so learning this is vital to becoming fluent in the language. With this in mind, Grades 3 & 4, I plan to have my daughter (and myself) go through the courses on Signing Online. There are 4 courses, so I plan for us to cover 2 a year. Grade 5, I plan for us to get in contact with a local deaf centre, and find activities to participate in with the deaf community-immersion, field trip style. So what about you? 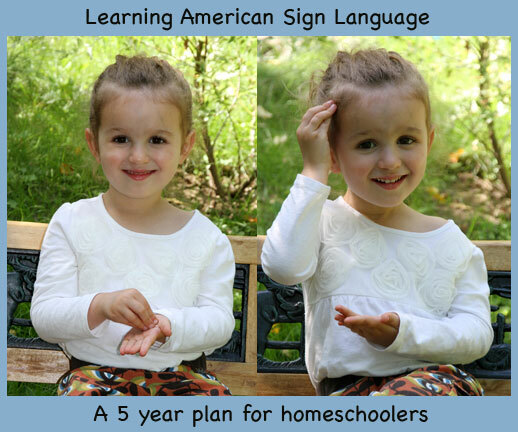 Do you think you could include learning American Sign Language as part of your child’s homeschooling curriculum? hi, I just found your website through babycenter.ca thanks for sharing. very helpful information. I’ve heard a lot of great things about Signing Time, but haven’t tried it yet. As we start easing into our homeschool year it’s definitely something I want to add. Thanks so much for sharing your plan! We did some ASL when ours were pre-verbal but it trailed off once they began talking. I took ASL in college but have lost most of it. Thank you for sharing the way you are including it into your curriculum. I love your long-term planning and organization skills! Thanks for sharing on Artsy Play Wednesday.